In the beer manufacturing process, the plate heat exchanger is essential, a variety of beer heating, boiling and cooling processes require the support of heat transfer equipment. Hofmann known as heat exchange equipment suppliers, has extensive experience in the field of beer heat exchange, in which one typical example is for Tsingtao Beer heat exchange scheme and equipment. Tsingtao Beer Co., Ltd. was founded in August 1903 by German businessmen and British businessmen joint venture. It has a long history of beer manufacturers in China, and is the 2008 Beijing Olympic official sponsor, whose current brand value is 116.875 billion Yuan, ranking first in the Chinese beer industry and the world's top 500 brands. Tsingtao Beer (0168) was listed on the Hong Kong Stock Exchange on July 15, 1993 and is the first overseas listed company in mainland China. On August 27, 1993, Tsingtao Beer (600600) was listed on the Shanghai Stock Exchange and became the first company to be listed on two lands in China at the same time. At the end of 2015, Tsingtao Beer in Chinese 20 provinces, municipalities and autonomous regions has more than 60 beer production enterprises, and its company size and market share are in the leading position of domestic beer industry. In 2015, Tsingtao Beer achieved a total sale of 8.88 million liters of beer, operating income of 27.635 billion Yuan, and the net profit of 1.713 billion Yuan attributed to shareholders of listed companies. At present, Tsingtao Beer exported to the United States, Canada, Britain, France, Germany, Italy, Australia, South Korea, Japan, Denmark, Russia and more than 90 countries and regions. In global beer industry authoritative report - Barth Report, according to the production rankings, Tsingtao Beer is the world's fifth largest beer maker. Beer manufacturing process mainly includes malt manufacturing process (malt drying and baking), saccharification process (saccharification pot and boiling pot), fermentation process (cooler, fermentation tank, low temperature lead) and products (sterilization tank). After the saccharification process finished, it is necessary to filter the saccharified liquid to obtain clear wort. Clarify the wort to be heated to 100 ℃ boiling, stop activities of amylase, kill all kinds of bacteria in the wort, and then remove the heat denatured protein coagulation. The clarified hot wort is finally exchanged with ice water to cool the temperature to the fermentation required. Hofmann’s plate heat exchangers in the application of Tsingtao Beer is mainly heating the beer from 72 ℃ to 92 ℃, to achieve a precise temperature control, and better guarantee the quality of the product. Hofmann provides on-demand heat transfer solutions for the Tsingtao Beer. 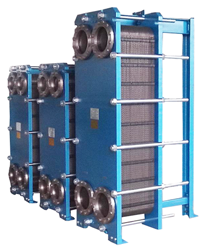 Efficient Hofmann plate heat exchanger products meet the beer manufacturing process heating, boiling and cooling and other processes about heat transfer temperature requirements. Hofmann constantly committed to the energy sector, with central heating co-generation opportunity, becomes a system integration equipment integrated professional supplier to provide investment system solutions, equipment supply and other services, maximum to meet customer demand to become one of the most valuable supplier in the thermal field.